The overall academic goal of the Lakota Studies Department is to integrate Lakota traditional values and history to the academic career in a bi-cultural setting or to meet the challenges and complexities of Lakota society. In order to achieve this goal, the Lakota Studies program offers a two year Associate of Arts degree program in four areas of emphasis: Lakota Language, Lakota History & Culture, Traditional Lakota Arts and Creative Writing. The department also offers four years Baccalaureate degrees in seven areas of emphasis: Lakota Language-General Interest, Lakota Language-Research, Lakota Oratory, Lakota History & Culture, Lakota History-Tribal Government, Lakota Language Teaching and Cultural Resource Management. The History, Culture, and CRM and tribal government degrees are Bachelor of Science degrees. In addition to the degrees offered by the Department, it also plays a support role in all other University academic programs since Lakota Language and Lakota History & Culture are required core courses. It is the intention to provide a bi-cultural perspective and promote sensitivity to all academic programs offered at the University. This is a very unique and powerful dynamic provided by the Lakota Studies Department. A second goal of this department is related to the reservation community at large: to extend non-academic services to the Tribe and its members. 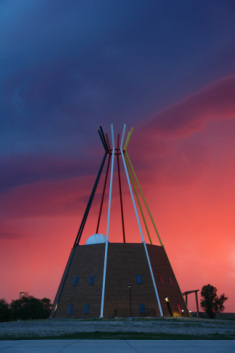 These services include offering expertise in Lakota culture and advocating for the integrity of traditional Lakota values and heritage. The department also takes a very active role in cultural protection, preservation and restoration. The most important role of the Lakota Studies Department within the institution is that it is the hub or center of Sinte Gleska University. This is a position of leadership and responsibility to all. The Department strives to show by example that Lakota values are not merely talked about in the classroom, but are integrated into daily actions. It is the belief of the Department that Lakota values and beliefs have much to offer the world today and provides a vision to follow into the future.